KNOXVILLE, Tenn. — After winning three SEC Tournament matches for the first time in program history, Arkansas’ impressive run in the 2018 conference tournament ended Saturday. In the semifinal match against No. 9 ranked and No. 2 seed Florida, the No. 11 seed Razorbacks tested and took the Gators down to the wire but fell short 4-2 at the Dr. Robert L. Barksdale Tennis Stadium. Arkansas’ tournament run this week started with a 4-1 win over No. 14 seed Missouri. A 4-2 victory over No. 17 ranked and No. 6 seed Auburn was followed by a 4-2 win against No. 6 ranked and No. 3 seed South Carolina. The Gators (18-7, 11-2 SEC) got on the board first Saturday, winning the doubles point by earning victories at the No. 2 and No. 3 positions. The Razorbacks’ No. 40 ranked pair of Tatum Rice and Ana Oparenovic earned their highest-ranked win of the season at the top spot, a 6-4 decision over the Gators’ No. 13 ranked tandem of Anna Danilina and Victoria Emma. 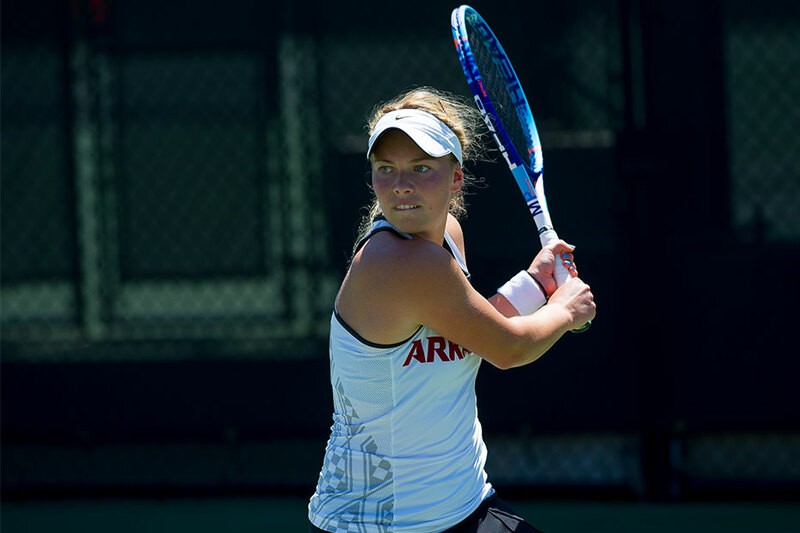 Arkansas (10-16, 3-10 SEC) quickly leveled the match at 1-1 thanks to a 6-2, 6-3 win at No. 4 singles by Natsuho Arakawa over Victoria Emma. Florida’s Peggy Porter outlasted Rice at No. 5, 4-6, 6-3, 6-1, before Mia Jurasic delivered a three-set win of her own at No. 3, 6-2, 0-6, 6-4, against No. 90 McCartney Kessler. The Gators closed out the match and secured the victory with a pair of triumphs, including the clincher at the No. 2 position. Katie Kubicz beat Jackie Carr 6-4, 4-6, 6-4 at No. 6, and No. 47 Josie Kuhlman edged out No. 89 Oparenovic 7-5, 7-6 (7-2) at the second spot. At the clinch, No. 50 Giulia Pairone led 1-0 in the third set against Florida’s No. 14 Danilina after winning a second-set tiebreaker.